In today’s news stories, a lot of time is devoted to eyewitness reports about peoples’ lives being drastically changed as the result of fire and water. We here about the destruction of homes and forests by violent fires; and in other areas, we here about heavy downpours causing floodwaters to rise and wash away homes and businesses, and we also here about people getting caught in these powerful catastrophes and losing their love-ones. Fire and water are two very powerful forms of energy. Spending my adolescence years in Tidewater, I grew to respect the authority of water. The ocean is massive and ever surrounding the land. If you’re not careful, the waves can knock you off your feet and pull you out into the swift current! But water is also a force that can give us positive things like electricity from our hydroelectric plants, nourish our food supply, a means of transportation, and water is necessary to maintain our lives and cleanse us free from dirt and sin. Fire can be destructive but it also has positive attributes such as cooking, refining minerals, illumination, and the warmth of heat to name a few. I am speaking today about these two forms of energy because Christ describes the Holy Spirit as both fire and water. Fire gives us the warming property of grace and the power of destroying transgressions; and in our baptismal water we are cleansed and our minds renewed. Verse 14 of the Gospel reading today speaks to us about these two energy sources in a different aspect. 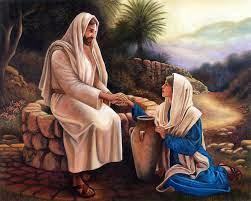 At the well, Christ instructs the Samaritan women (Svetlana) about the Holy Spirit. The description includes a motion started by the Holy Spirit that then keeps regenerating, it is contagious! Saint John Chrysostom describes the grace of the spirit as a source of energy that purifies and refreshes us. Just as a source of energy cannot ever be fully contained, the Spirit is constantly causing a reaction within us. The Lord is asking us to be good stewards of this precious lively gift. Blessed Theophylact, Archbishop of Orchid and Bulgaria, instructs us not to bury this talent as did the servant in the parable found in Matthew 25, but to put it to work so it will increase. 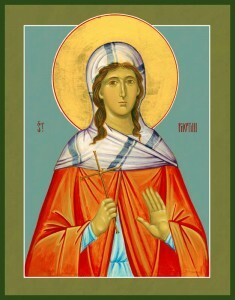 The Samaritan woman at the well spent the rest of her life contagiously preaching the Gospel of Christ. In her sixty-sixth year, Svetlana was tormented and thrown down a well. We celebrate her memory on March 20th as the holy Martyr Svetlana or Photina in Greek. The powerful energy that was given to her in the Holy Spirit was not hidden or repressed but she chose to increase it and spread the Gospel. She allowed the energies of fire and water to consume her life and spread from her temple outward as a beacon on a hill and as a raging storm that could not be contained. Maybe I can one day be like this great saint! “Go therefore and make disciples of all the nations, baptizing them in the name of the Father, and of the Son, and of the Holy Spirit [Mt. 28:19].